Power Up! Take breakfast, lunch, and dinner to the next level with these healthy, low carb power bowls! Ok, in case you didn’t know: the bowl is the new plate. Power bowl recipes have taken over Instagram and Pinterest, and in case you’re wondering you CAN enjoy these nutritious, versatile, and downright gorgeous bowls on a low carb, keto diet! But before you go diving face first into Goddess smoothies and hippie bowls, there are a few facts you need to know! 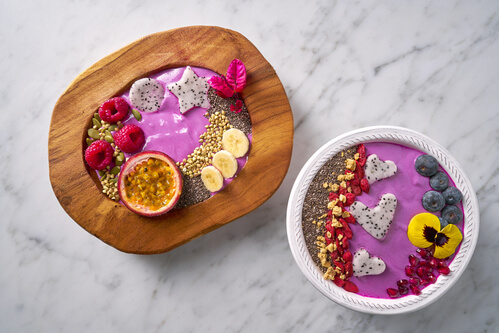 A smoothie bowl is exactly what you think: a fruit-based smoothie served in a bowl. 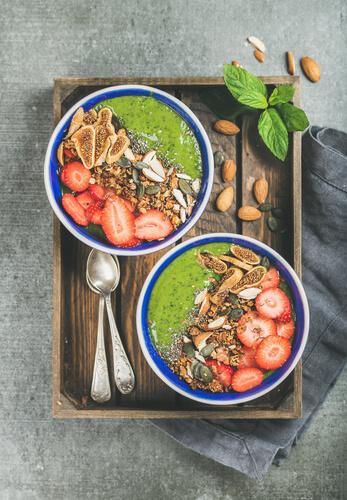 I have seen fabulous, plant-based, clean eating smoothie bowls and I’ve seen evil smoothie bowls full of lies. Take the photo above as an example. Do you see those heart and star-shaped fruits? Do you know what kind of time we are talking about investing when we’re meal prepping fruit shaped like stars? Now before I go on a rant about decorative flowers in breakfast recipes let me tell you- Smoothie bowls can be a healthy addition to your low carb breakfast lineup if you pay particular attention to the base ingredient AND watch out for sugar-especially in fruits. Stick with a few raspberries, blueberries, and strawberries and skip the bananas! Also known as hippie bowls, Buddha bowls are typically full of nutrient-dense raw vegetables, greens, and grains. Think quinoa and brown rice bases covered in vegetables topped with assorted seeds and nuts. And that’s fabulous, but if you’re watching carbs, not so much! If you’re following the keto diet or cutting carbs, you’re going to need to pay attention to the base of the bowl first. Avoid the grains, noodles, and brown rice and opt for keto-friendly, low carb bases like cauliflower rice, shirataki noodles, noodles, or cabbage. As for the veggies, go for it, but try to stick with the ones that grow above ground like spinach, broccoli, cauliflower, and cucumbers. Root veggies like potatoes and sweet potatoes are out because they are both loaded with carbs! Pronounced (poh-kay) Poke Bowls hail from Hawaii and are typically full of raw fish, rice and vegetables. All Poke bowls start with a base ingredient like brown rice, sushi rice, quinoa, soba noodles, or cabbage. Ready to try a few healthy, low carb power bowl recipes? Here are 25 of the best low carb, keto-friendly power bowl recipes for breakfast, lunch, and dinner! Save or Share these Power Bowls!